We have two adjoining apartments in the elegant Helios building in Bareges, each sleeping up to six people. The Helios was built in the nineteenth century as a hotel by the Rothschild family, it is located in the centre of Barèges and is a listed historical building. The apartments have off-street parking, there is a heated open-air public swimming pool (small charge, open July and August), a ski and bike store, squash court, one has a large terrace. Our Helios apartments are very well equipped with high speed wi-fi, dishwashers, washing machines, hi-fi and satellite TV. 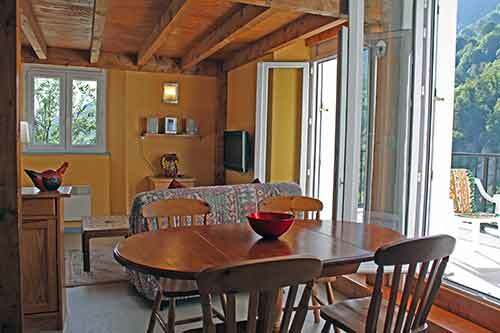 Both the apartments offer magnificent views over the surrounding mountains. They offer the perfect location for a summer or ski holiday in Bareges, with easy access to both footpaths and ski lifts. Village shops and restaurants are all within a couple of minutes walk. We offer short stays and try to be flexible on arrival/departure dates. Our information pack contains all you need to explore this beautiful region with guides to the walking and wildlife.